Are museums our new spiritual centres? Like the cathedrals of past centuries, museums have become our architectural wonders. Tourists travel to the Louvre to venerate I.M. Pei’s pyramid as much as Leonardo’s Mona Lisa, and Bilbao has become a new pilgrimage site since Frank Gehry’s Guggenheim Museum opened in 1997. Museums resemble places of worship in another way: they speak to a community’s higher aspirations. They challenge our limitations and present models of behaviour to emulate or avoid. They provide opportunities to come together, but also for introspection and solace. On a recent visit to Melbourne, I needed a little solace, because I had just been to church. I had peeked into St Paul’s, the city’s Anglican cathedral, in hopes of an escape from the crowds and crushing heat. For a moment I felt that wonderful rush of dark, cool, smallness and quiet that one experiences (well, I do) when entering a long-established place of worship. But the feeling didn’t last. Tourists and locals, in their t-shirts and sandals, were busy talking and snapping pictures. An elderly local bragged to her visiting friend about the size of the church; a Chinese girl posed pensively while her boyfriend moved about the pews taking photos (he had purchased a $5 permit from the cathedral store, so no one minded). 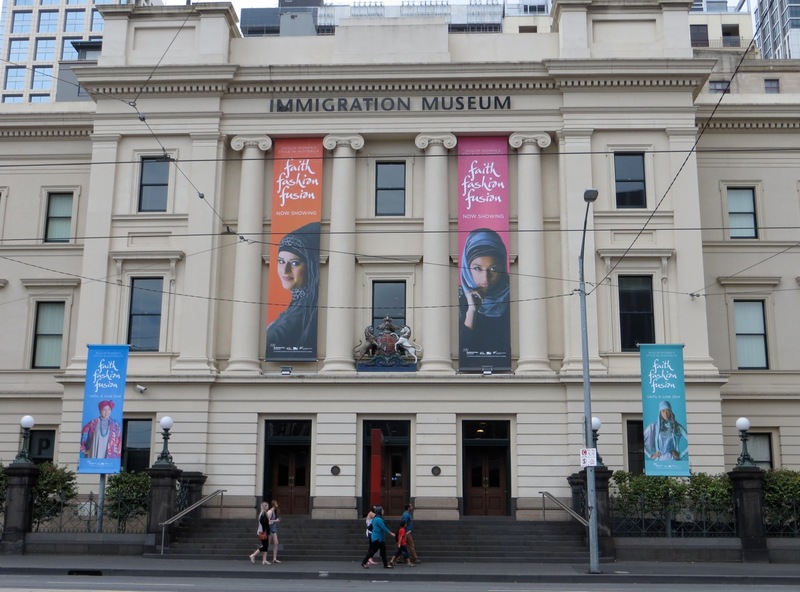 This wasn’t the ideal state of mind for visiting Melbourne’s Museum of Immigration. I was already a bit on my guard; I’m not a fan of exhibitions that are too preachy. And immigration exhibitions, like some churches, tend to present the ignorance of the past leading to the multicultural rewards of the present. But a tourist’s got to do what a tourist’s got to do. So I departed St Paul’s and worked my way past the businessmen and backpackers of Flinders Street. The Immigration Museum has a grand and fitting home in the State of Victoria’s former Custom House. From the 1850s, immigrants to Victoria passed through here, along with all imported and exported goods. Indeed, the Customs House was the primary source of government income for Victoria. “Until the introduction of income tax in 1915,” reads one display card, “customs duties raised some four-fifths of all government revenue.” Two important sources of income were imported opium (legal until 1905) and exported gold, which was discovered in Victoria in 1851 (just a short time after Victoria had separated from New South Wales. Some colonies have all the luck). A small room in the museum exhibits the kind of material that the customs officers tried to keep in (indigenous birds) and out (questionable reading material from Balzac to American horror comics). As the museum shows, they also had ways to keep people out. But before an immigrant can get thrown out, they need to get there. The entry to the first room posits a question: “Why did you or your family come to Australia?” A ten-minute video of old photos and film clips and new testimonials offers five answers: War and Conflict, Family, Disaster, Freedom, A Better Life. Watching this, one easily believes that the world beyond Australia is a dangerous place. We see images of Jewish prisoners in Nazi Germany, earthquake survivors in Greece and Turkey, Bangladeshis fleeing India, Sudanese fleeing famine. Who wouldn’t want a better life in Australia, imaged here in suburban houses and crowded white beaches? The following room provides a decade-by-decade overview of immigration in Victoria, from the 1830s to the present. These descriptions run along the walls, while changing presentation cases in the middle of the room tell the stories of individual migrants. During my visit the displays ran from the British ornithologist John Cotton, noted for his writings and watercolours of Victorian birdlife, to Yasser Al-Alyawi, an Iraqi musician whose family emigrated (with great difficulty) after the fall of Saddam Hussein. While there is some discussion of the nineteenth century, the focus here and elsewhere is on post-Federation experiences. A small display on the history of the building leads to “Journeys of a Lifetime,” a ship-shaped exhibition of accommodations from different eras of sea travel: plain, uncomfortable bunk beds from the nineteenth century lead to swankier spaces for travellers in the early to mid twentieth century. A sailing journey that could take three months in the 1850s was halved by steamships at century’s end and further shortened by ocean liners and finally airplanes in the twentieth century. As the exhibition demonstrates, these forms of transport didn’t only carry people and their belongings to Australia: they also brought rats and cockroaches to sunnier climes. The museum’s most remarkable exhibition, “Getting In,” examines the policies and procedures behind immigration to Australia. Here again, the focus is on the twentieth century. On 1 January 1901 the six Australian colonies became a single independent nation. Within months, the new parliament had passed the Immigration Restriction Act, a troubling reminder that Federation and the White Australia Policy went hand in hand. The Act’s most notorious element was the introduction of a dictation test, in which the would-be immigrant had to write out a fifty-word passage in a European language chosen by the immigration official. The museum provides a typical example of a passage in English that would challenge even a native speaker. But an unwanted migrant from China or Malta might be given the same test in Dutch or Scottish Gaelic. It was the government’s way of keeping out people of colour without putting its racist intentions in writing. But various objects on display make these intentions clear. The sheet music for “White Australia” (1910) includes the lines, “Our Northern Territory no longer is to be the open gate of coloured immigration. This continent of ours is now a white man’s land and not for alien surplus population.” Not very catchy, but sadly familiar. Suddenly the policies of the current Australian administration seem less an anomaly and more a part of a long, unfortunate genealogy. While such static exhibits provide valuable insight into the pro-white practices and attitudes of Australia’s past, an inventive installation nearby gives visitors the chance to role-play as an immigration officer. Visitors sit at a table in an enclosed, quiet space. 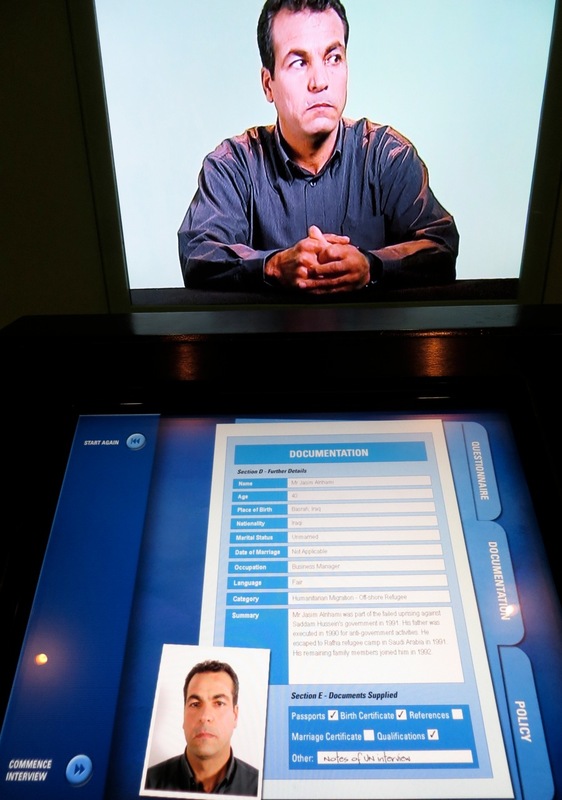 A video screen on the table provides information about potential immigrants to be interviewed; a video screen on the wall opposite presents the immigrant him or herself. Visitors choose from three eras: the early twentieth century, when the White Australia policy was in full force; midcentury, when some reforms had been introduced but white English speakers were still preferred; and contemporary, “colourblind” times. We listen to the questions asked and the answers given, watch the applicant’s body language (shifty eyes, telling fidgets, or confident assertiveness), grade his or her responses and skills, and finally support or reject the application. Then we learn what an official of the time would have decided. Some visitors will be immediately dubious of the whole enterprise, which in effect encourages us to identify with government authority over an individual or family in migratory limbo. It’s certainly, and by necessity, simplistic. But there are some insightful touches. A white British couple from the 1950s declares that they’ve applied for immigration to Australia because they’ve heard such wonderful things about Vancouver(!). The husband has had some minor encounters with the law and some minor health issues. They’re neither smart nor very likeable, but it’s the White Australia era, so they get in; but one immediately wonders if these same answers would be used to reject applicants whose English was imperfect, or complexion not so pasty. By contrast, a Chinese woman from 1920 is denied a visa extension and must leave her husband and children (who are all Australian citizens). Among the twenty-first century applicants, an Iraqi man is denied entry because he seems to obfuscate his education and military record. But after surviving the Iraq war, and spending years in a camp in Saudi Arabia, it seems little wonder that a refugee would struggle to remember details, or question whether completely honest answers will be understood (he initially denies serving in the army, but later explains that he did so as a young man because it was mandatory). If nothing else, I learned that I have no future playing God in the immigration service. Despite my preferences, the British couple got in and the Chinese woman was deported. The point, I suppose, is that even the immigration officer is limited by the laws of his or her time. The installation also provides an interesting denouement: we watch as the applicants are told the official decision. What do you say to a distraught mother who will be forcibly separated from her husband and children? Or to a man who must now return to a refugee camp and start all over again, trying to convince another country to accept him and his family? The experience is disconcerting, as it should be. As these figures lash out in anger, stare in disbelief, or struggle to say something to keep the conversation going, we almost forget that this is all a game for us, because we know such decisions are made every day. As the opening question (“Why did you or your family come to Australia?”) suggests, the target audience is national as much as international. During my three visits, however, I was struck by the divided visitor demographic: older people, evidently interested in tracing or reflecting on their own family history; and young, overseas visitors, taking advantage of the free student entry. I hope the staff can come up with ways to attract more Australians between 30 and 60. The museum also says little about the continued high immigration of New Zealanders, white South Africans, British and Irish to Australia. Perhaps these are old stories. Still, I would have enjoyed a display on (say) the challenges faced by Maori and Pacific Island peoples in contemporary Australia; or the impact of the relatively recent stream of South Africans on Australian culture. The museum avoids any strong declarations on the current debate around refugee boats. Fair enough; museums aren’t religious institutions, after all. They should broaden our perspectives and force us to see an issue from angles we may have overlooked. The Immigration Museum does this well. Religious institutions, by contrast, should give us guidance. 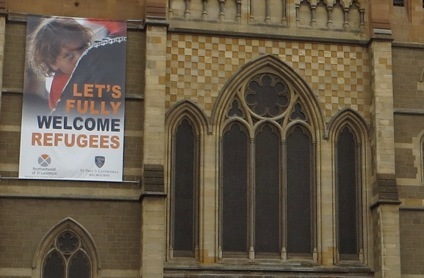 As I crossed the street and walked back to Federation Square, I noticed the enormous banner that hangs from the façade of St Paul’s Cathedral: “Let’s Fully Welcome Refugees.” Amen to that. I enjoyed the way you teased out some important issues in a thoughtful and sometimes provocative way, Tom. Well done.